On January 19th, Robert Ramsey of Push Square published an interview with Digimon Story Cyber Sleuth producer Habu Kazumasa, in anticipating of Sleuth's upcoming international launch. Habu discussed the methodology of his team's game design for Sleuth, explaining their reasoning behind directing a game at adults rather than children, and choosing turn-based over real time combat. One point in the interview stands out; when asked about calling Digimon the 'Pokémon of PlayStation,' Habu responded by defining an immense difference in concept and appeal between the two franchises. "Pokémon is set in the fantasy world where the Pokémon's existence is normal. However, Digimon is based on a structure in which the various dramas are created by the encounters between the human beings of our reality and the Digimon from the unusual digital world. While the Digimon's existence is abnormal and they are drawn as monsters, their common senses change through meetings between Digimon and humans, and then new relationships are created. I think this is the interesting, essential quality of Digimon." Habu also pointed out that Digimon has become progressively more successful as a result of Digimon World Re:Digitize on the PlayStation Portable and Digimon Collectors on mobile phones shifting its age demographic higher. Implicitly, Habu is referring to the franchise's failure to appeal to children during the Xros Wars era--a time which proved devastating for the brand, in which less than 1% of all Japanese households were watching the TV anime, and initially strong toy sales ultimately petered into losses for Bandai. Once again, Habu emphasized that there were originally no plans to release Cyber Sleuth overseas at the time of its original development. The producer attributed the game's international launch--as he has many times in the past--to the Operation Decode fan petition. As for whether future Digimon titles will see localization, he stated "If this title becomes a success, we can hopefully consider a worldwide, simultaneous launch for the next title. 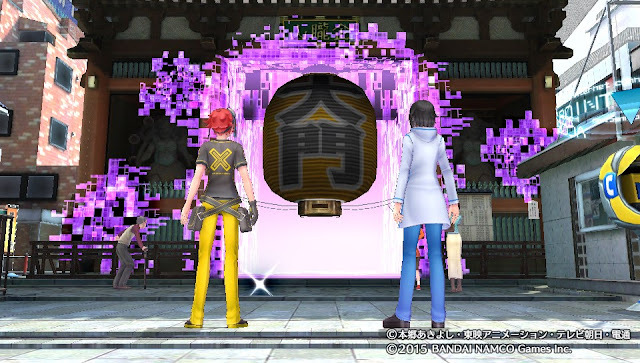 [...] It will all depend on [Cyber Sleuth's] success for the future." The "next title" Habu alluded to is probably not meant to be thought of as -next 0rder-, due to the late stage of development the game is currently in and its rapidly-approaching Japanese launch date. Digimon Story Cyber Sleuth will launch on the PlayStation Vita and PlayStation 4 in North America on February 2nd, 2016, and in Europe on February 5th, 2016. First print copies of the game will come with downloadable content for Beelzebumon Blast Mode and Cherubimon Vice, two new Digimon exclusive to the international versions of Cyber Sleuth. While the Vita edition in North America and Europe is digital-only, the launch DLC will be available through the end of the month, and import seller Play-Asia is stocking a physical Asian-English edition of the game. The game is rated T in North America, and PEGI 12 in Europe. That's true, they are completely different. Although the two franchises are good, I can identify more with the core concept of Digimon. Ever since I was a kid eventhough pokemon was more mainstream and easier to access(was a pokemon fan from 2003-2013 when i felt the stagnation) had better games, digimon always felt more special and dramatic because of the concept. Do we know if a digital version will be available for purchase on the PlayStation TV yet? The PSTV is just a Vita emulator without touchscreen support, and to the best of my knowledge Bandai has yet to publish a game that's incompatible with it, so I'd be shocked if it's not compatible. The Japanese CS worked with the PSTV.